Butternut squash is a delicious winter squash with a slightly sweet and nutty flavor. There’s something about a bowl of butternut squash soup that is perfect for warming you up when it’s cold outside. 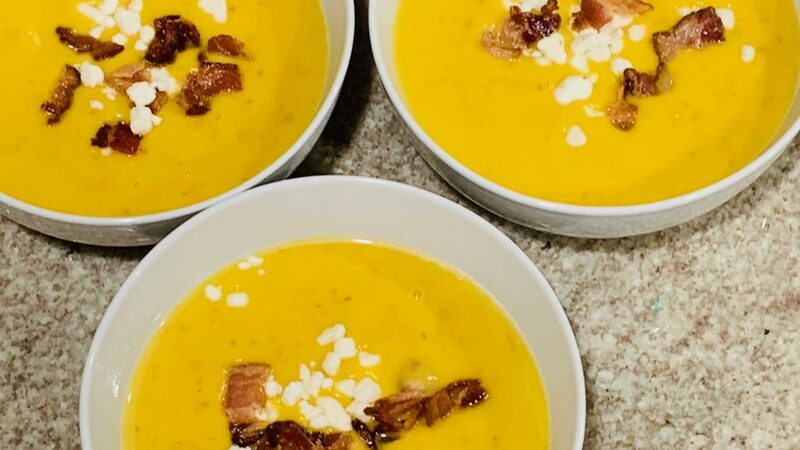 This Pressure Cooker Butternut Squash Soup recipe starts off with crisping up some bacon, using the Sauté or Brown function. 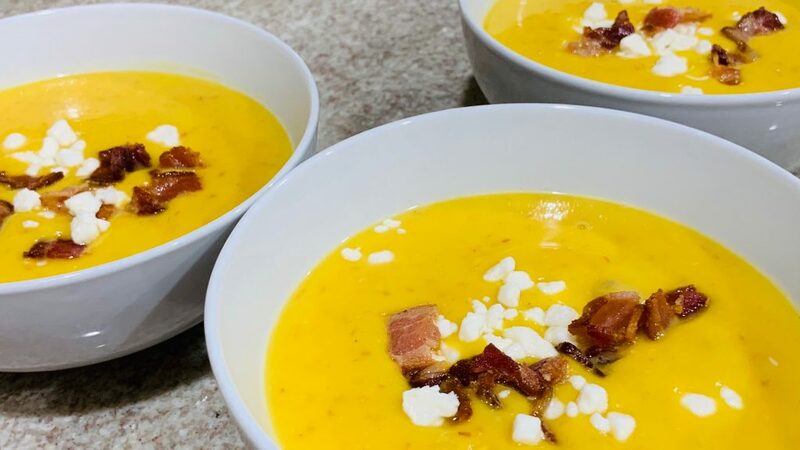 The smokey, savory bacon is the perfect compliment to the sweet squash. And bacon makes everything better, right? While the bacon is crisping, dice up some onion and garlic. Once the bacon is crisp, reserve half of it to use as a topping later. Then, add the garlic and onion to the pot and sauté them too. 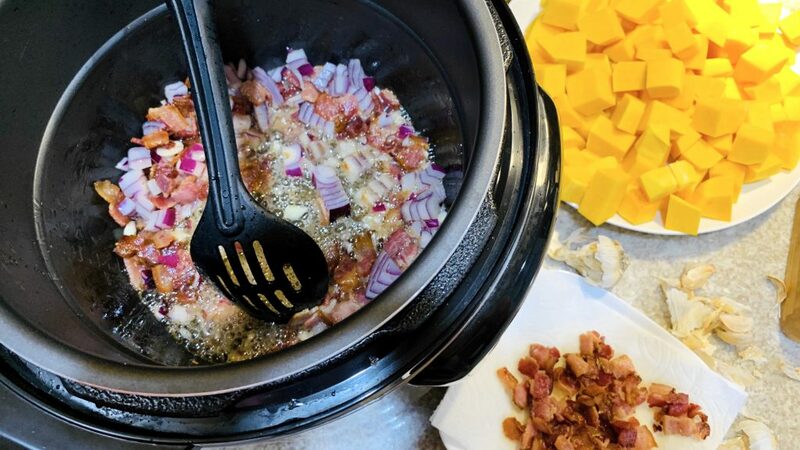 You can also make this recipe in a slow cooker, but then you have to cook your bacon and aromatics in another pan. The nice thing about the pressure cooker is you can do everything all in one pot. After sautéing the onion and garlic for a couple minutes, add in the cubed butternut squash. I sautéd the squash for a couple minutes too and then added in chicken stock. Now it’s time to cancel the sauté function, put the lid on the cooker and pressure cook for 10 minutes. 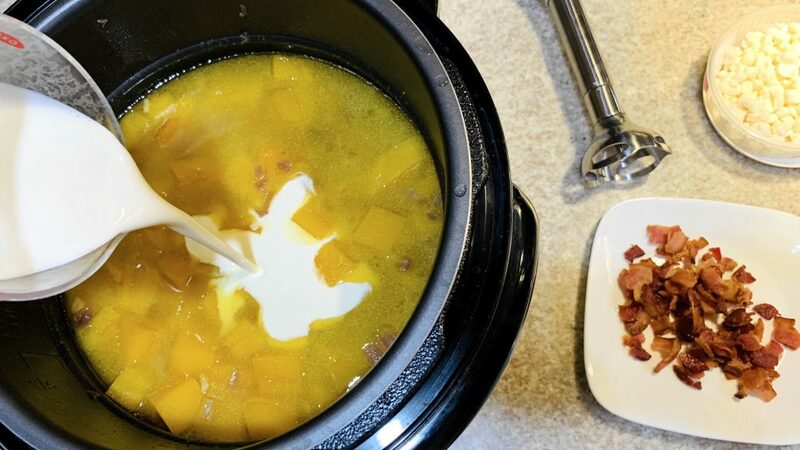 If you’re making your soup ahead of time, you could leave it at this point and let the Instant Pot keep the soup warm until you’re ready to eat. 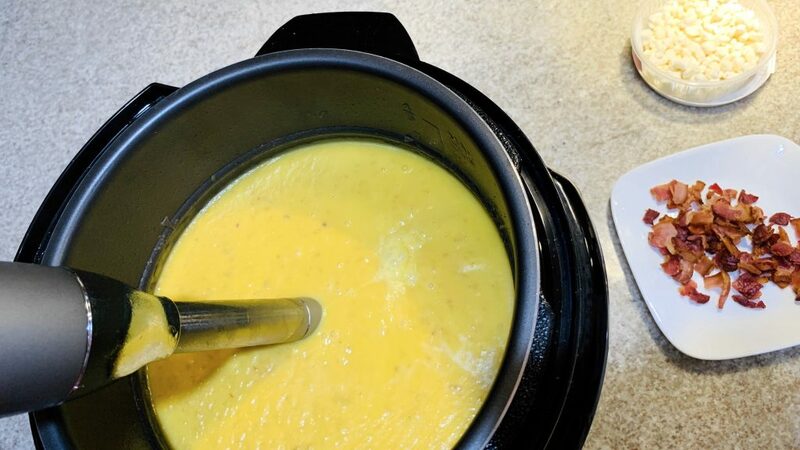 Finally, add heavy cream to your Pressure Cooker Butternut Squash Soup and blend it. I think an immersion blender is the easiest way to do it. You can also blend in batches in a regular blender, just be careful because it is hot. Once the soup is blended until it’s smooth, it is ready to eat. Serve it with the reserved bacon from the first step. We also like to add crumbled goat cheese or feta for one more dimension of flavor. 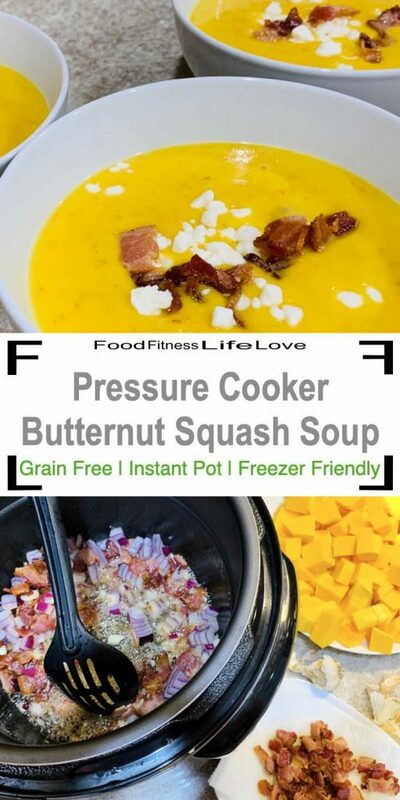 Pressure Cooker Butternut Squash Soup also freezes well, if you’re prepping meals for later. 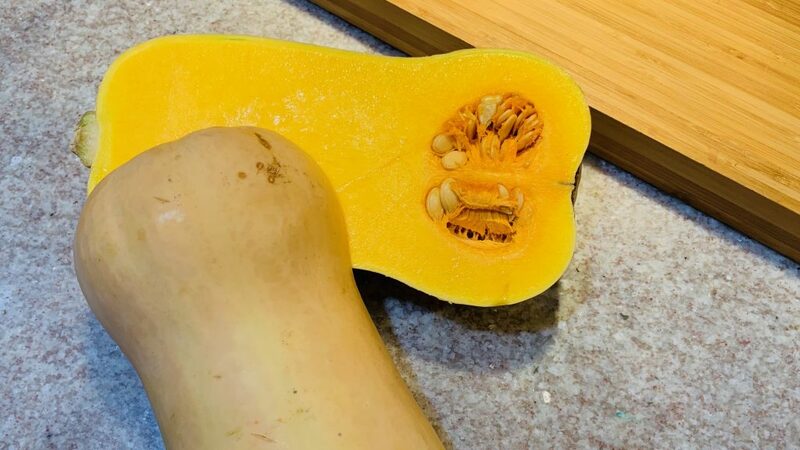 Slice the butternut squash in half and remove the seeds. 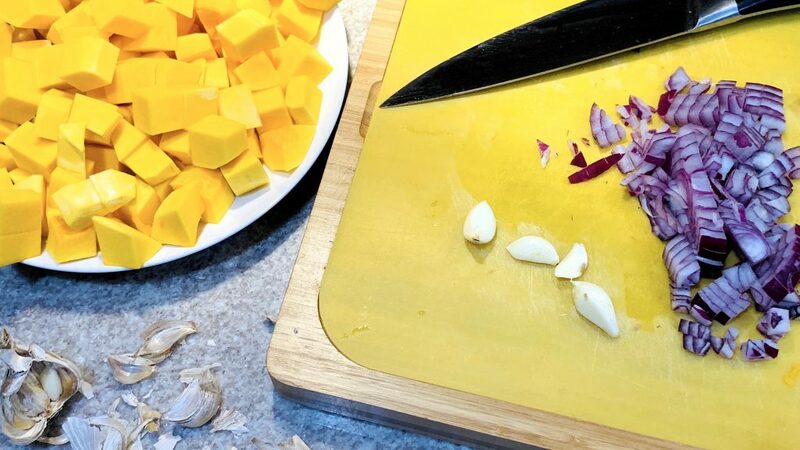 Peel the squash, discarding the skin, and cut into cubes, approximately 1 inch, and set aside. 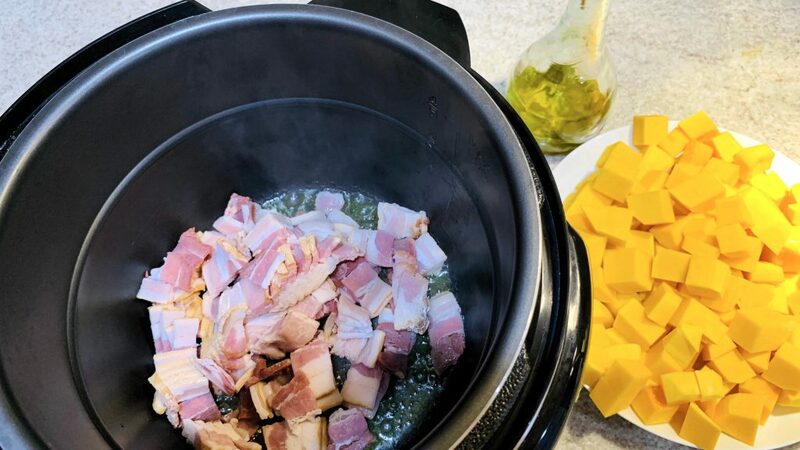 Turn on your pressure cooker – instant pot to the brown or sauté mode and add the olive oil to the pot. Chop the bacon and add to the pot. Sauté for about 10 minute until crispy. While the bacon is cooking, dice the onion and garlic. Once the bacon is crispy, remove half and set aside for later. Add the diced onion and garlic to the remaining bacon in the pot and sauté for 2 min. Add the cubed butternut squash and sauté for 3-4 minutes. Add the stock to pot. Cancel the sauté function. Put the lid on the pressure cooker and make sure the relief valve is closed. Pressure cook for 10 minutes and then let it naturally release for 5 min. After 5 minutes, manually release the remaining pressure. Add the heavy cream to the pot and immersion blend until desired consistency. Serve with the reserved bacon and optional toppings as desired. Enjoy.